Registration FAQ :: What are the key deadlines? The Fontana Village Resort room block closes April 21, 2019. We expect the block to fill before the hotel expiration date. You are advised to reserve your room as soon as possible. Click here for the location FAQ. Late registration begins June 1, 2019 and includes a $100 surcharge. The deadline to sign up for the BRI Meal Plan is June 21, 2019. 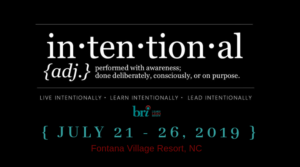 Late registration ends July 7, 2019. The final refund deadline is July 7, 2019. At Check-In, each attendee will receive a program book detailing the daily schedule for the week, including daily speakers, reflection groups, skill labs, activities for the whole family, and time to connect with each other. NEW! Meal Plan :: Deadline to register, June 21st. Fontana Village Resort is a busy venue and the restaurants will be very full around lunchtime when the BRI program session concludes each day. To avoid those lengthy waits, BRI has arranged for NEW options for an exclusive buffet lunch for our members and guests. The meal plan is available on Monday, Tuesday and Thursday, and can be purchased for $40.00 for all 3 days. Lunch is half-price for children ages 6-10, and free for children 5 and under. On each day, lunch will consist of a featured sandwich, soup, salad bar, dessert, tea, and water. This will be more economical and faster than the other restaurants on the property. Please consider pre-purchasing your lunches on this meal plan to avoid the lengthy waits at the Fontana Village restaurants. It’s also a great opportunity to catch up with other Blue Ridgers over a casual meal. The deadline to sign up for the BRI Mean Plan is June 21, 2019.